Summary: Theia Alderson has always led a sheltered life in the small California town of Serendipity Falls. But when a devastatingly handsome boy appears in the halls of her school, Theia knows she's seen Haden before- not around town, but in her dreams. My Thoughts: We are introduced to Theia who lives with her father. Her mother died a long time ago. Her father is very strict and conservative and expects Theia to be the same way. He is very strict on her, not allowing her much independence or freedom. She is from a small town called Serendipity Falls and is in high school. She has two best friends named Donny and Ame. The girls really care about Theia and try to look out for her as best as they can. A mysterious new boy enters Theia's dreams. His name is Haden Black and he is handsome, dangerous, and alluring. Theia starts to dream about him and she doesn't understand the dream. Than the next day she sees him at school! How ironic that she dreamt of him and now he's at her school. Theia can't figure out how that can even be possible. Come to find out, Haden isn't human and he really is dangerous. He was sent to earth to bring back a human bride and he choose Theia long before he came up! Theia starts a romance with him both in and out of her dreams and their paths intertwine. Theia starts to go to the underworld (thats basically what it is) and while she's there she meets Haden's mother and boy let me tell you she was evil! I won't say much else about the plot unless I will give away everything! I'll finish by saying that it took me a while to get into Falling Under. At first, I was reminded of Personal Demons which I read a few months ago. 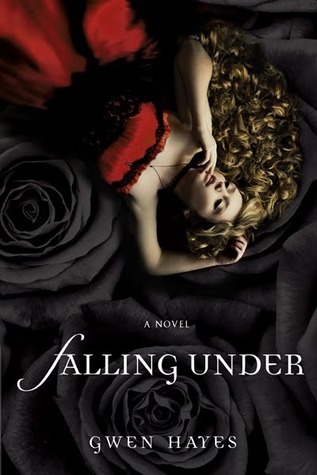 Maybe if I hadn't read it as of late, Falling Under wouldn't have seemed so much like it. There were a lot of similarities; take for example the strict upbringing but there were also a lot of differences (for example, minus the love triangle from Personal Demons). The storyline felt slow at first and it took me a while to get into it. By the middle of the book I couldn't wait to keep reading to find out what Haden really was or what exactly his problem was. Did he like Theia or not? Was it all a game or did he know something we didn't? And I liked seeing Theia grow up a little bit and gain some independence. 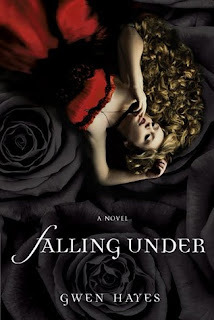 Overall: I really enjoyed Falling Under. Once the story picked up, it was a wonderful read. It was truly beautiful in its own way. Cover: Beautiful beautiful cover! Love it!